Eight students from the University of Arkansas Cyber Hogs team got a crash course in real-world cyber defense last month at the National Collegiate Cyber Defense Competition. 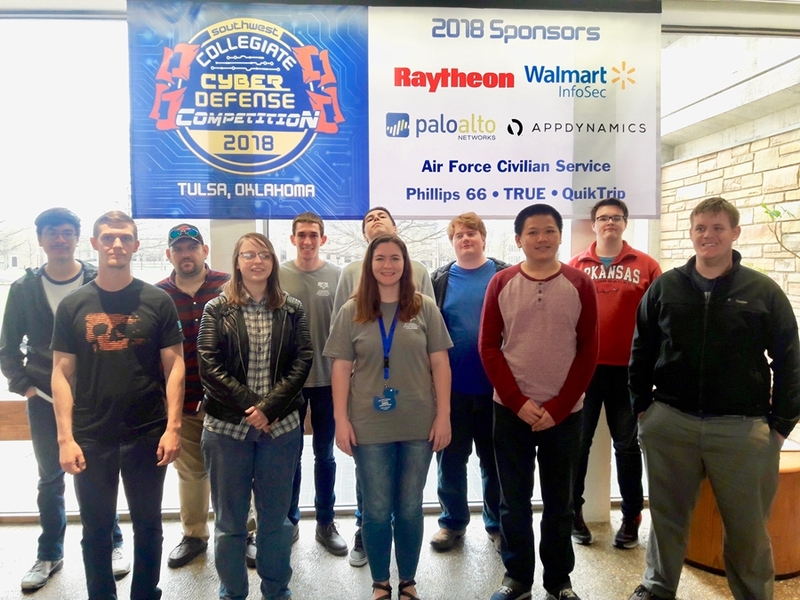 Led by senior computer engineering major Andrew Beers and senior computer science major Lauren Rainbolt, the Cyber Hogs bested 18 teams earlier this year to qualify for the regional competition in Tulsa, Oklahoma. The Cyber Hogs are a team of undergraduate and graduate students who practice skills like software coding, application protection, firewalls, system configuration, endpoint security and network security as an extracurricular activity. The team of eight was placed into a simulated real-world environment running the cybersecurity for a casino while a "red team" of hackers tried to break into the system over two days. The simulation was complete with a volunteer CEO doling out additional tasks while teams tried to maintain the system. Dylan Walker, a senior computer engineering major, said the simulation was among the most challenging cyber-defense scenarios he'd ever faced. "The best way I've heard it put is that they throw two years worth of problems at you in two days," Walker said. No team is intended to succeed in every scenario, the true contest is to see which team can last the longest, he said. For Rainbolt, the experience highlighted the importance of teamwork and communication in a stressful real-world setting. "We learned the importance of communications skills as a team," she said. "The vast majority of the time we did a great job, but in the middle of defending our systems there were times when it broke down. It stressed to us the critical nature to share the technical information we all were seeing." The team didn't qualify for the next round, but all three students felt they left a positive mark on the competition. One of the team's biggest differentiating factors was the presence of Alan Greenberg, who is the Chief Information Security Officer for the University of Arkansas, team member said. "The other teams were blown away that we had the CISO of our university there helping us," Walker said. Rainbolt added "It's due to the passion Alan brings, not only to the competition, but he's there every week helping us. Other schools were shocked by that." For all three seniors, the competition, and their involvement with the Cyber Hogs, was a chance to pursue a passion for cyber security. "I don't think you could leave that competition and not want to learn more," Walker said. "It was an amazing experience." The Cyber Hogs will be better prepared for next year and we are looking forward to returning to the competition, Greenberg said. About the Cyber Hogs: The Cyber Hogs are led by two sponsors: Faculty/academic lead Dale Thompson, associate professor in the Department of Computer Science and Computer Engineering, and Alan Greenberg, chief information security officer for Information Technology Services. The team meets Wednesdays at 5 p.m. in J.B. Hunt Transport Services Inc. Center for Academic Excellence.